iPhone users can now view u2log.com in a new, iPhone-ready theme. Made possible by the WPtouch plugin for WordPress. The theme works automatically for iPhone users, but if you rather continue to use the regular site, there’s an option in the footer on WPtouch for you to easily switch between the different views. … and a follow up post: The U2 iPod and Its Relationship to the Beatles Deal. New York loves U2, and U2 love New York. A Bono sighting in the Big Apple is a rather common occurrence these days. An Edge or Adam Clayton sighting isn’t completely unheard of either. 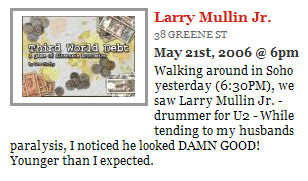 A Larry Mullen sighting, however, is a rare thing because, despite his pretty-boy looks, Larry has the magical ability to move among common-looking people without getting noticed often — which is why we took note of a sighting of the U2 drummer in the city posted at Gawker.com. We can only imagine what Larry was doing in Soho (uhh…shopping? ), but we do suspect that he noted the large photo of his friend Bono in the window of the Morrison Hotel Gallery on Prince Street, where there is an exhibition of rock photography by Neal Preston taking place through June 2nd.